The 22nd Annual Fulton Lions Club Duck Derby splashes down from Noon to 5:00 p.m. Sept. 3 in the canal park behind Tavern on the Lock Restaurant, 24 S. First St., it was announced by David Dingman, club president. “This year’s event features thousands of dollars in prizes and live entertainment by ‘The Fabulous Ripcords’ presented by The Red Brick Pub, and free face painting for kids,“ Dingman said. “First place wins $2,000, sponsored by Fulton Medicine Place, and last place wins two season tickets to Syracuse University Football. The ducks ‘race’ at 4:00 p.m. in the Oswego River. The 22nd Annual Fulton Lions Club Duck Derby splashes down from Noon to 5:00 p.m. Sept. 3 in the canal park behind Tavern on the Lock Restaurant, 24 S. First St., it was announced by David Dingman, club president. 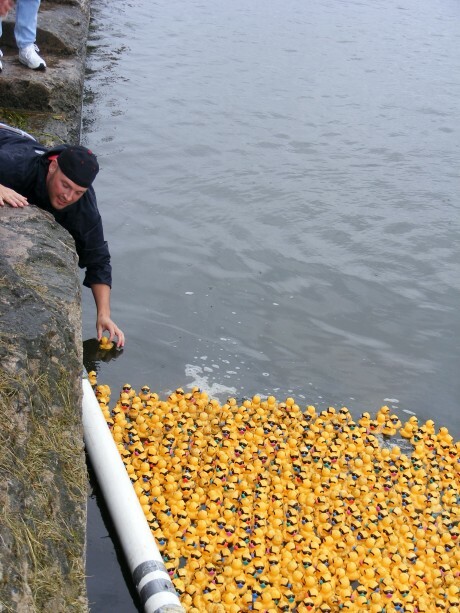 Fulton Lions Duck Derby Chairman Fred Aldrich (above) plucks the winning ducks from the Oswego River in the 2011 derby. Tickets are $5 each or six for $25 (one free ticket), Aldrich said. Tickets are available at Chirello Advertising, Fulton Medicine Place, Phoenix Medicine Place, the Greater Oswego-Fulton Chamber of Commerce Fulton office, and from any Fulton Lions member. Tickets are $5 each or six for $25 (one free ticket), said Fred Aldrich, event chairperson. Tickets are available at Chirello Advertising, Fulton Medicine Place, Phoenix Medicine Place, the Greater Oswego-Fulton Chamber of Commerce Fulton office, and from any Fulton Lions member. As many as 3,000 spectators have attended the event and all proceeds benefit the Fulton community through Lions club programs, Adrich said. Previous Duck Derbies have raised as much as $10,000. The Fulton Lions Club is part of Lions Club International (LCI), which was founded by Melvin Jones in 1917. It is the largest service club in the world with over one million members in more than 170 countries. The Fulton club, with 50 members, is one of the largest and most active Lions clubs in Central New York. Lions Clubs are committed to sight and hearing projects. Fulton Lions have joined with LCI to support Campaign Sight First II to help prevent blindness worldwide. Fulton Lions provides financial assistance for those in need of eyeglasses, eye exams and hearing aids. During the past year, Fulton Lions have paid for more than $7,000 in eye exams, hearing aids and eyeglasses for Fulton residents. for the Blind program that trains Seeing Eye dogs for the blind, and the Finger Lakes Lions Hearing Foundation. Anyone interested in membership in the Fulton Lions Club, or seeking more information can visit the club’s web site at www.fultonlionsclub.org. Correspondence can be mailed to Fulton Lions Club, c/o Steve Chirello, P.O. Box 727, Fulton, NY 13069.